Harada’s Tigresse is my special treat now ! Recently, I feel like eating something sweet foods so frequently. 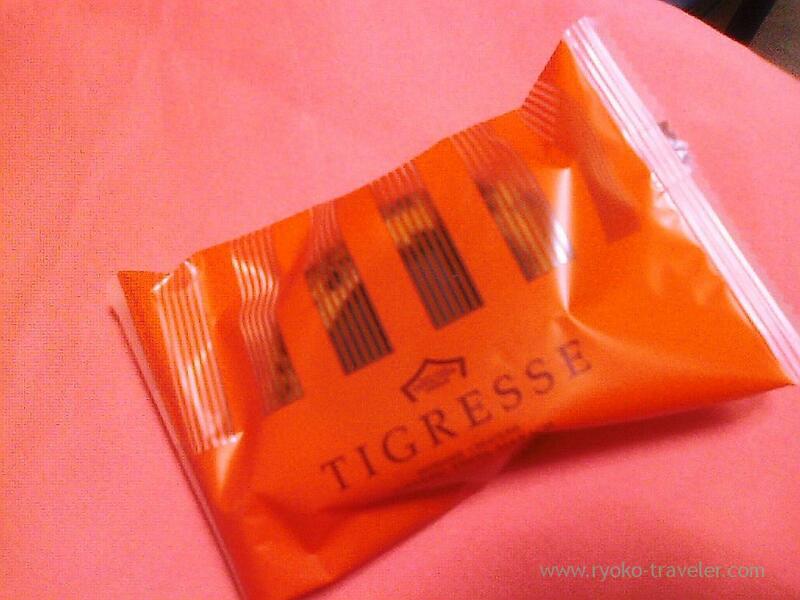 Especially I wanted eat GATEAU FESTA HARADA’s Tigresse very much. I like it because it isn’t too sweet. I like sweet confectionery, but I can’t eat too much and I hate too sweet foods. There’s chocolate in the center. And the cake had chocolate chip 🙂 It is flavory and had light taste. I think I can eat too much ! Teasing foods ! So, I buy only one bag (having three TIGRESSE !) of it ! No. Everything should be bought so. Buying much confectioneries is dangerous. Of course, if you have strong will, there’s no problem buying much confectioneries once. Recently Harada’s area has been extended and many people left Harada because they might have got tired of the rusk. I don’t like rusk very much. Especially, sugar rusk. Now, I feel like eating Suikodo’s strawberry daifuku !